Why Harvard's new president and Cornel West couldn't just get along. Harvard president Lawrence Summers's first semester in charge was barely under way last September when Artemis Records released Cornel West's CD Sketches of My Culture. Essentially, Sketches was a collection of the Harvard Afro-American Studies professor's musings on black culture, dumbed down for urban teens and backed by some lame jazz, hip-hop, and R & B. Summers wasn't impressed. Neither was OJ Lima, executive editor of Vibe magazine. "Black-pride songs in rap music are not new," the 29-year-old editor notes. "Public Enemy was doing that when I was in, you know, ninth grade." The CD came up a month later in a now-notorious discussion between Summers and West about West's lack of recent scholarly output. Two months after that, someone leaked to the press that some of West's Afro-American Studies colleagues were thinking of following West to Princeton. Then all hell broke loose over what was, in essence, a disagreement between a university president and one very-high-profile professor over the quality of his work. As liberals and conservatives noisily duked it out in the national press over whether white guilt and political correctness caused Summers to cave in to the racial demagoguery of Jesse Jackson and Al Sharpton, the inclination around Harvard Yard was to keep tightlipped and let the issue die. Certainly, that was what Afro-American Studies department head Henry Louis Gates Jr. intended when he pronounced the matter settled. But people close to the issue are still talking about it around Boston and Cambridge, and what they're discussing now — mostly off the record — is not the same simple black-and-white argument that was debated nationally. The widespread feeling — and not just among whites — is that Summers was right to question West's recent track record. Finally someone was bounding through the racial minefields and speaking up. Which contrasts with the silence that greeted West's promotion in 1998 to university professor, making him 1 of just 17 out of Harvard's 2,000 faculty members who hold the university's most exalted teaching title. His new post allowed him to lecture in any department and meant he reported directly to the president rather than to a dean, which is why he was meeting with Summers in the first place. But some privately questioned whether his qualifications matched his promotion — in a way they did not question the simultaneous promotion to university professor of his extremely qualified Afro-American Studies colleague William Julius Wilson. "[There were] a lot of raised eyebrows," recalls Harvard sociology professor Orlando Patterson, "but no one came out and said anything about it." After all, West was a big-deal public intellectual because of his 1993 bestseller Race Matters. His main fields of study — philosophy and religion — were too arcane for most academics in other fields to pass judgment on his scholarly work. And, perhaps most important, he was black. There is at least some truth to black conservative Shelby Steele's argument that whites especially, at least in academia, are uncomfortable criticizing blacks out of fear of being labeled racist. Some still dispute that West's work is worthy of his post, though few besides Steele are willing to say so publicly. But if West was going to hold the title of university professor, the thinking went, it was high time he did some university professor-caliber work. And if Summers was guilty of anything, it was of having the audacity to say so to West's face. The facts of the October meeting between Summers and West are still being debated around Harvard Yard. Summers is rumored to have wanted to personally examine the progress of West's scholarly work every three months. And Summers allegedly suggested that West's political work for Bill Bradley and Al Sharpton was distracting him from his duties at Harvard. Whatever was actually said, West said he left the meeting so offended he "planned to resign on the spot." Instead of pulling up stakes, however, West sat tight. Things didn't boil over until Jesse Jackson decided to show up at St. Paul's A.M.E. Church in Cambridge on New Year's Day to question Harvard's commitment to affirmative action. The same day, Al Sharpton reportedly threatened a lawsuit as an "aggrieved party." With the controversy back on the front page of the New York Times, Summers was soon reiterating his support for racial diversity and formally trying to make amends with West. Predictably, the liberal posturing of Jackson and Sharpton prompted similar knee-jerk responses from Steele and others on the right, who decried Summers's apparent concessions as the capitulation of white guilt to black mediocrity. Back in Cambridge, however, Steele's argument didn't ring particularly true. It was noted that Summers's endorsement of diversity was not a change of policy. Professors at Harvard anonymously shared their opinions that Summers was right to question West's less scholarly pursuits and whether they were distracting him from his main job on campus. 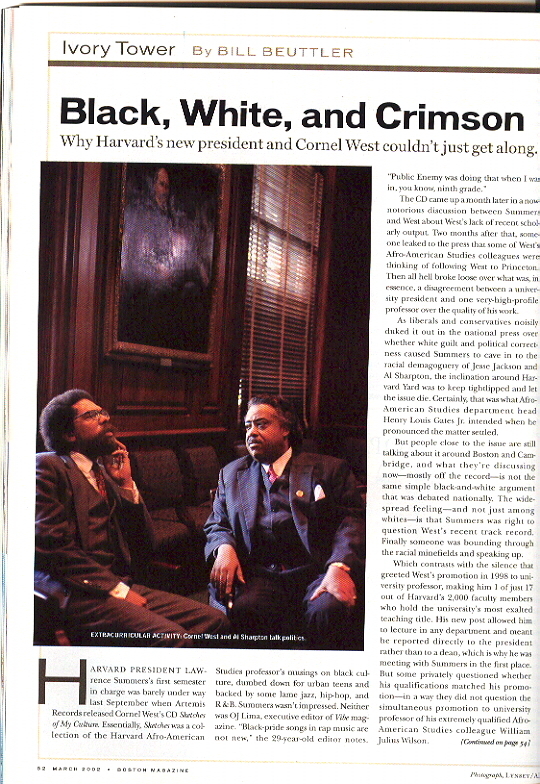 Then there was the reaction around Harvard Yard to Jackson and Sharpton getting involved and the speculation that they had done so because Harvard Law Professor Charles Ogletree — who acted as West's spokesman — asked them to. Not only did their participation in the controversy make many professors uneasy (including, it was said, some in Afro-American Studies), it also turned out to be a tactical blunder. If the idea had been for West's adoring students to storm the barricades behind Jackson and Sharpton, it failed. Harvard students may get better grades than they deserve to, but they're no dummies. Fighting for a tenured professor with a six-figure salary and a standing offer to return to Princeton didn't seem as important as, say, fighting for Harvard's janitors to earn a living wage. The fact that three black alumni put pressure on Gates rather than Summers was even more telling. In their never-publicized "Appeal to Henry Louis Gates Jr. and the Black Faculty of Harvard University," the three alumni — one of them an assistant professor of politics at Brandeis — urged Gates and his colleagues to "put the larger institutional and scholarly agendas above individual grievances" and work to hold the department together. "We...affirm President Summers's apparent concern for scholarly excellence and productivity," the appeal said, "and encourage him to cast a critical eye throughout the entire university, and not just the Department of Afro-American Studies." Meanwhile, a critical eye was being cast on the new president's lack of diplomatic skills. Summers arrived at his new job with a reputation for having a brilliant mind, sharp elbows, and a willingness to challenge the status quo (especially in comparison to his predecessor, the largely ineffectual conciliator Neil Rudenstine). "It's not just black professors that he's upset," says Orlando Patterson. "He hasn't made the transition from faculty to administration." Patterson is black, and, though he's not in the Afro-American Studies department, he has taught at Harvard long enough to have known Cornel West as an undergraduate. And long enough to recognize the potentially dangerous clash of personalities involved in a meeting between West and Summers, who came to Harvard after serving as Bill Clinton's treasury secretary. "Economists are notorious in academic circles for the way they posture when they meet," Patterson explains. West, by contrast, is a "warm-hearted, friendly, gracious person. I've never heard Cornel say a harsh word about anyone." West is an enormously popular and talented lecturer (nearly 600 students completed his Introductory Afro-American Studies course this past fall), and his head teaching fellow, Martha Nadell, calls him the best teacher she has ever seen. There is considerably less consensus about whether West's books are any good. New Republic literary editor Leon Wieseltier wrote a 5,000-word review of seven West books in 1995, in which he argued that they "are almost completely worthless...noisy, tedious, slippery...sectarian, humorless, pedantic, and self-endeared." But Slate magazine's Jacob Weisberg, who wrote two years ago about West's campaigning for Bradley and agreed with a couple of Wieseltier's criticisms, also found things to like, especially in Race Matters. "His main strengths are his thoughtfulness about America's racial divide and his charismatic enthusiasm about bridging it," Weisberg opined. "Nobody denies that Mr. West is talented," summed up the Economist in its account of the West-Summers feud. "But is his work any good? He is the author of more than a dozen books, some of them serious contributions to his field. But lately he seems closer to becoming a performance artist — and a poor one at that." Which brings us back to the Subject of West's CD, Sketches of My Culture. "Those who are connoisseurs of the art form think it's pretty bad," says Washington University professor of English and Afro-American Studies Gerald Early, laughing. So why did West subject himself to such a pratfall? Early thinks that black middle-class guilt may have had something to do with it. Black intellectuals, he notes, often feel responsible for the plight of poorer blacks left behind by middle-class flight from the inner city. "There's not a lot an academic can do," says Early. "But I think African Americans come to an occupation like this with a sense of obligation. [W.E.B.] Du Bois and Carter G. Woodson and people like that were sort of models in the sense of being what they called 'the scholar activist' — trying to make what you're doing relevant to people." West fancies himself in the Du Bois mold. "Present-day black scholars," he writes in Race Matters, "tend to be mere academicians, narrowly confined to specialized disciplines with little sense of the broader life of the mind and hardly any engagement with battles in the streets." But Patterson thinks his one-time student is misdirecting his energies with his political work and CD. West has "chosen the path of the religious preacher, something which is already well done [by others]," he explains. "There's still a great big, yawning hole there in Afro-American thought for doing what he's qualified to do. Cornel certainly had it in him to write a couple of major books, and he's clearly decided not to do that. I'm personally a little saddened by that." Vibe's OJ Lima disagrees. He applauds West's attempt to connect with a hip-hop audience. "That's precisely why Cornel West is Cornel West," he says, "and Orlando Patterson is just another guy who teaches classes at Harvard." So where does all this leave Harvard? Jesse Jackson warned that losing stars like Kwame Anthony Appiah, West, and Gates would "blow a hole in the fuselage of academia at Harvard," but few buy his argument. Appiah is headed to Princeton, but he was careful to emphasize that he is leaving for personal reasons. Gates says he'll wait until the fall before deciding whether to join his best friend and collaborator of 29 years. Asked if West's departure would be ruinous to Afro-American Studies at Harvard, Patterson responds with a simple "no." West's harshest critic doesn't think it matters much, either. "The question of whether Cornel West will do nothing at Harvard or do nothing at Princeton," says Leon Wieseltier, "is not a question of national importance." Sample text - a long description of your work.